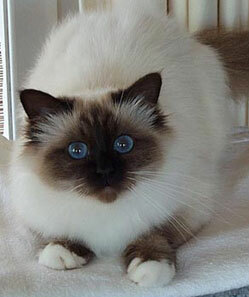 The face of the Birman is a conventional cat face, not compromised by extremes. The expression should be sweet with characteristic blue eyes set wide in a broad face. They come in a variety of colours with the traditional Seal and Blue points still being favourites. However, chocolate, lilac, red, cream, tortie and even tabby points are available. Mention of the fine features of the Birman cannot be complete without discussion of the 'gloves and gauntlets'. These are the very distinctive white feet of the Birman that make our breed one of the most difficult for the show bench. For the pet owner, suffice to say that a Birman should ideally have even gloves on all four feet with the gauntlets being the spearhead of white up the back hocks. This feature is much easier discussed than achieved! 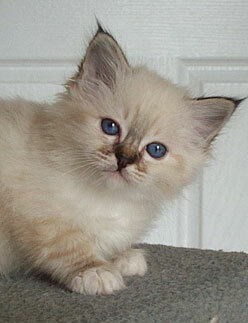 The Birman is a semi-longhaired breed. The coat is non-matting, soft, silky and easy care. The coat requires grooming once weekly with powder, comb and brush. 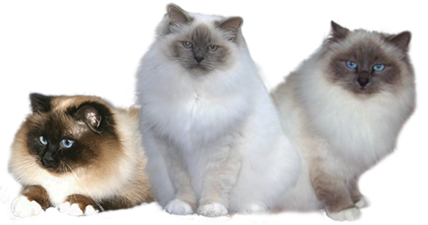 Birmans are actually classed as a semi-longhair due to the fact that their coats do not achieve the length or texture of the pedigree Persian. The coat however, still reaches a pleasing length and as a bonus, does not require daily grooming. It does need to be groomed weekly however, as no cat will be maintenance free! Even though a Birman has a very easy care long coat, this does not mean it never requires grooming. It is still recommended that you brush and comb your Birman once a week. In the spring it may also be a good idea to give your cat a bath using a hand held shower nozzle, gently over the skin. Use a 'wool wash' or gentle cat shampoo to clean your cats coat and help loosen the dead fur in the early moult. You should invest in a cat comb with rotating teeth. These are gentle on the cat but will remove a lot of dead fur. The other essential is a "slicker" brush. This is a square brush with fine metal bent teeth. Also check your cats mouth at regular intervals. They are not brushing their teeth every day so their teeth can become troublesome and need veterinary cleaning as they age. Bad teeth are just as painful for your cat as for you! Eating will become a problem if the mouth is sore or infected. Try to train your cat to chew strips of meat or bones such as chicken wings or lamb brisket. This is not successful for all cats as they can be amazingly lazy for carnivores! If they will take to this type of food it can have life long benefits for the health of their mouth. There are also Dental biscuits available from your vet or pet store, these will help prevent or delay the need for a full dental treatment. The breeder you buy your Birman from should supply you with a diet information sheet so you can settle your new kitten into its new home with the minimum of stress. It is important that you use this guide.